Ambode: Will This Cup Pass Him By? The Lagos State 2019 Budget presentation is fast turning into an ugly spectre that holds no good for the state and the ruling party, All Progressives Congress (APC). Clearly, it has exposed the fact that the ruling party in the state is yet to get past the avoidable scheming and high-wire intrigues that rocked it ahead of its last gubernatorial primaries in October 2018, which pitted the party apparatchik, led by its National Leader, Asiwaju Bola Tinubu against the incumbent governor, Akinwunmi Ambode. What has changed in the current political bout is the partyâ€™s enforcer. The Lagos House of Assembly (LAHA) has replaced the partyâ€™s favoured candidate going into the primaries, Babajide Sanwo-Olu, in the Red corner while governor Ambode retains his position in the Blue corner. Everything else remains the same. The Objectives remain the same â€“ make governance uneasy for the governor as a way to prevent him from leaving office in a blaze of glory and humiliate him as a punishment for daring the partyâ€™s decision to step aside for Sanwo-Olu ahead of the party primaries. The move by the Lagos lawmakers to prevent the governor from presenting the 2019 budget is thus interpreted by analysts as a plot in the larger script. It is initially reasoned that if Ambodeâ€™s moves to have the budget presented and passed, he could have the funds to complete some of the ongoing projects in the state and exit office on May 29, in a blaze of glory. One particular subject matter in this grand plan is the Oshodi Transport Inter-change. The project, when finished, will complete the transformation of Oshodi started by the Minister of Power, Works and Housing, Babatunde Fashola. Besides, many commentators have predicted that when completed, Oshodi would compare with Strafford in East London â€“ a strategic, multi-modal transport hub and gateway into London from outside of the British capital city. But latest twists in the political space have revealed new intrigues and survivalist power play. Interestingly, a sub-plot of the party apparatchik and believed to being pushed by the hawks in the party remains the bidding of Tinubu, who is also a former two-term governor of the state. The sole objective of the sub-plot is to bring Ambode to his knees for going against the directive of Tinubu not to contest the party primaries. This was soon exacerbated by the fear that the governor could undo them in the election as a way to pay back. â€œSome hardliners within the party are not content with just denying Ambode a second term ticket. They are bent on punishing him more. They want him humiliated and finished off politically and they will use anything they can lay their hands on, including the budget issue,â€ a party insider alleged. That summarises the ongoing cat and mouse game between the Lagos Assembly led by its Speaker, Honourable Mudashiru Obasa and Ambode, regarding the presentation of the 2019 budget estimate. The two gladiators, Ambode and the legislators, have continued to trade blame on who is responsible for the delayed presentation of the budget proposal. The state Commissioner for Budget and Planning, Olusegun Banjo in a statement said the budget had been sent since last December. But according to him, the House claimed it could not deliberate on the document, because it was sent in via correspondent and needed to be properly presented before it could be deliberated on. Honourable Oluyinka Ogundimu raised the objection in plenary in early January and his views carried the day. Efforts by the governor to properly present the budget before the house has however been frustrated by the Obasa-led legislator since January. Matters, however, reached a head on Monday, 21 January, when the governorâ€™s effort to officially present the budget to the house was allegedly frustrated by the lawmakers. Prior to the day, the governor had reportedly intimated the leadership of the house of his preparedness to present the budget penultimate week. Media sources at the seat of power had confided in this newspaper that that Governor Ambode was ready to present the budget but was denied access by the legislators, allegedly at the behest of the party leadership in the state. Another source in the assembly also dismissed this narrative, saying although there was the understanding between the governor and the lawmakers that the budget would be allowed penultimate but that no particular date or day was agreed to. However, when the governor settled for the Monday in question, he didnâ€™t clear from them the night before, only to send an advance team in a manner that embarrassed the legislature. The plot however assumed another twist, when the legislators accused the governor of spending funds from the 2018 budget that was neither laid before it nor approved. They also gave Ambode one week to come forward to shed more light on the allegations bordering on why he has been executing a budget that was yet to be approved by the assembly. The lawmakers also alleged that the 2018 budget performance was yet to hit the 50 per cent mark as at the third quarter of that year. They had said that the alleged infractions were unearthed by a special committee it set up and chaired by the Deputy Speaker, Hon. Wasiu Sanni-Eshinlokun. Before announcing the summons, Obasa admitted that the infractions were a violation of the constitution and noted that it was important that Ambode was given a fair hearing on the issue thus the need to invite him over. â€œThe attorney-General, finance commissioner and commissioner for budget and economic planning that ought to have advised the governor did not do so. The most important thing is that we should let the people know that a budget that has yet to be approved was being spent, which was why we could not attend to the governor on the budget on Monday 21, January. â€œWe must then give them a fair hearing and explain what happened. The point has been made that there must be something before the house before you can commence expenditure. We want to call on the governor to come within a week to explain himself. We can start gathering signatures for impeachment. We can wait till another time,â€ Obasa said in plenary. THISDAY findings revealed that the position of Obasa had been well rehearsed in a closed door meeting of the legislators sometime between Monday, January 21 and last Monday, January 28. But in the open, the position of Obasa was supposedly informed by a report presented by the Deputy Speaker of the House, Wasiu Sanni-Eshinlokun, who chaired an ad-hoc committee set up to look into the issues surrounding the 2018 budget estimate during a parliamentary meeting of the legislators. According to Sanni-Eshinlokun, the committee discovered several infractions, when it met with relevant commissioners and heads of some agencies. Among the infractions were that the 2019 budget estimates were already being implemented while yet to be laid before the LAHA and that the 2018 budget implementation was yet to hit the 50 per cent mark as at third quarter of 2018. The question on the minds of observers of the unfolding drama in the state is, will the Lagos Assembly go the whole hog and impeach Governor Ambode? The contributions of another lawmaker, whom assembly credited with immense influence among his colleagues, Dayo Saka-Fafunmi, was also suggestive of the long term intent of the lawmakers, which is to impeach the governor. Saka-Fafunmi had said, â€œPublic funds do not belong to any of us, it belongs to the people of Lagos State. Section 120 sub section 2 states that no money should be withdrawn of the state unless it is approved by the House. Clearly the legislators are all out for war and ready to bare their fangs. Who could rein them in? Sources in the know continue to mention one name and one name only: Tinubu. Observers and pundits conversant with politics of the state said the ongoing budget impasse is a classic case of the voice of Jacob and the hand of Esau even as they noted that what is playing out is at variance with the progressive politics that the state is reputed for. In fact, one party source said â€œAsiwaju drums the tune our lawmakers are dancing to and he is about the only one that could stop them otherwise Ambode will go down in the history of the state as the first executive governor to be impeached. It goes without saying that Nigeriaâ€™s politics is replete with intrigues and deft maneuverings, Lagos State politics is not an exception. Rather, the state rank tops in both political sophistication and intriguing power play that governor Ambode appears to have been caught in. While the stateâ€™s Commissioner for Budget and Planning said in a statement that the budget estimate was already before the legislators and was intended to be read by December 24, 2018, the Assembly denied it and said it had been waiting for the budget estimates since September, which was the practice. Hard as the legislators are trying to mask the reasons behind their hide and seek game with the governor, observers contended that they are up in arms with him on purely matters of politics. Meanwhile, observers have interpreted the lingering impasse as basically high wire politics at play and nothing related to development of the state. This contention is supported by the sentiments against Ambode in the party even as they insisted that the governor is baying for revenge on account of being denied a second term ticket. This sentiment being pushed by the hawks in the party gained more prominence in the aftermath of the official gubernatorial election kick-off in the state, which was disrupted by bloody rival gang fracas. But it predates the unfortunate event. The campaign kick-off came to an abrupt end after rival factions of the National Union of Road Transport Workers (NURTW) chose the Sky power grounds venue of the campaign to flex muscle in a supremacy battle. In the melee that followed, a top gun of the union, Musiliu Akinsanya aka MC Oluomo, was stabbed, while three journalists were injured and hospitalised. Many other party members had similar experiences. But some APC members fingered official involvement, thus insinuating the governor might have a hand in the bloody mÃªlÃ©e by creating the cover for the thugs to reign supreme. Some party sources also alleged that the governor was enacting a secret anti-party script in league with the Commissioner of Police, Lagos State Command, Edgar Imohinmi, who is believed was a class mate of the governor. THISDAY checks could not ascertain this, however. Though the governor and Imohinmi are alumni of the University of Lagos, they were there at different times and for different courses. While the governor had his first degree in the institution, the commissioner of police was there for a post graduate degree, having had his first degree at the University of Jos. In line with this thinking, they also insinuated that Imohinmi might have provided cover for the aggressor faction of the NURTW, insisting that it was unimaginable that the hoodlums could carry out such unruly behaviour with so much security presence at the campaign grounds even when the venue was a shouting distance from the headquarters of the Lagos Police Command. Another allegation against Governor Ambode borders on alleged romance with the opposition PDP. Words among APC politicians in the state and which is being vigorously pushed by local government council chairmen is that Ambode pledges his continued loyalty to the party during the day and fraternise with the PDP in night. 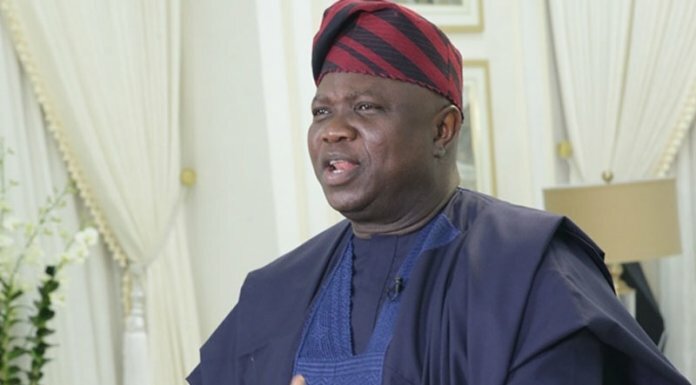 An aide, to one of the local government chairmen told this newspaper that â€œAmbode has refused to fund Sanwo-Oluâ€™s campaign, whereas he has donated money to Jimi Agbajeâ€™s campaign. His refusal to release money for Sanwo-Oluâ€™s campaign is affecting the momentum of the campaign. The aideâ€™s principal is Chairman of Agege Local Government Council, Kola Egunjobi, a fierce loyalist of House Speaker, Obasa. Further findings also revealed that Ambode is being accused of plans to stifle the APC governorship campaign of funds while funneling same to the PDP through a one-time commissioner for energy and his staunch associate, Wale Oluwo. He resigned last December in the aftermath of Governor Ambodeâ€™s failed second term bid and immediately joined the opposition PDP. The foregoing informed the fight-back by the APC, a leg of which is the threat to impeach Ambode currently being enacted by the stateâ€™s legislators. Another leg of it the plan, though less brutal, is to frustrate him for the remainder of his tenure. The move to decapitate and literarily bring the governor down to his knees, it was gathered, was the reason behind the push to replace the police commissioner with Kayode Egbetokun, a former police aide of Tinubu. The posting was however halted by the new Inspector General of Police, Muhammed Adamu, even as observers opined that Imohinmiâ€™s days at the Lagos Police Command remains numbered. The first casualty in the unfolding drama is the budgetary tradition of state. Lagos is reputed for always getting the stateâ€™s budget ready before the second week in January. Findings corroborated by legislative staff at the Assembly showed that since the advent of the current republic, the Lagos budgets were always passed by December ready for the governorâ€™s assent in January at the latest. Commentators opined that the budget impasse holds no good for the state, insisting that the disposition of the Lagos Assembly called to question the progressive inclination that the state legislature has always been known for since the advent of the current democratic dispensation. Observers also lampooned the leadership of the stateâ€™s legislature for breaking away from this legislative tradition, adding that under Obasa, the assembly has sacrificed a commendable budgetary tradition and reputation on the altar of cheap politics, arguing that the legislatorsâ€™ recalcitrance has overshadowed the excuse that Ambode sent in the budget estimate late. Ambode also got some flak from analysts, who argued that he has demonstrated poor reading of the political barometer of the state and left his flanks poorly guarded. According to multiple sources at the Alausa secretariat, his opponents far outnumbered his not many loyalists even though some of his loyalists are moles, which are why his every move is easily found out and leaked to the political establishment in the state. Beyond the budget standoff and the threat to impeach him, analysts contended that momentum of governance has slowed down owing largely to needless distractions that the governor is being subjected to. They also wondered why the political gladiators find it hard to sheath their swords. However, on the surface, Governor Ambode may stand to lose out in the power play if the lawmakers carry out their threat to impeach him. This explained why some commentators opined that Ambode should show contrite and eat the humble pie to save his political career by reaching out to the powers-that-be to stave off the impeachment. And as a pointer to what his political fate may be if he chose otherwise, they recall the fate of Lady Kofo Akerele-Bucknor. The damage could get worse as history may just repeat itself and see the APC becoming the biggest loser. On the long run, the APC could be the ultimate loser. The stubborn standoff between the Femi Agbalajobi and Dapo Sarumi factions, which eventually favoured the late Sir Michael Otedola to become governor, is no different from what is currently playing out within the APC. The protest votes that finally did the damage are beginning to be visible in the political horizon of the state this time. In the final analysis, observers are miffed with the push to impeach Ambode and foresee dire consequences for the party and developmental strides in the state even as they cautioned the Lagos political establishment not to get over-confident and arrogant in the belief that Lagos will always return to the APC. Besides, they query the rationale behind impeaching the governor at this time, considering that elections are only few weeks away. More importantly, they worry that if the APC apparatchik goes ahead with the plan to impeach Ambode, history may just be about to repeat itself, even as they tarry to see whether or not this cup will pass him by.